Community Baptist Church of Allenville supports a variety of missionaries who actively spread the gospel of Jesus Christ as a part of our engagement in and obedience to the Great Commission. A few have been highlighted on our website. Others are living in regions of the world that are not accepting of Christians, let alone missionaries, and publicizing their whereabouts puts them at risk. Please join us in prayer support for these who are serving the Lord in cross-cultural settings locally and internationally! Larry and Sue Correll serve the Lord through strengthening Christians and offering Christ to those who don't know Him as Savior. Timothy Ministries and its worldwide partners are involved in evangelism, discipleship, church planting, and educating pastors. Larry serves as the Executive Director. Larry and Sue call Beloit, WI home when they are not "on the road". 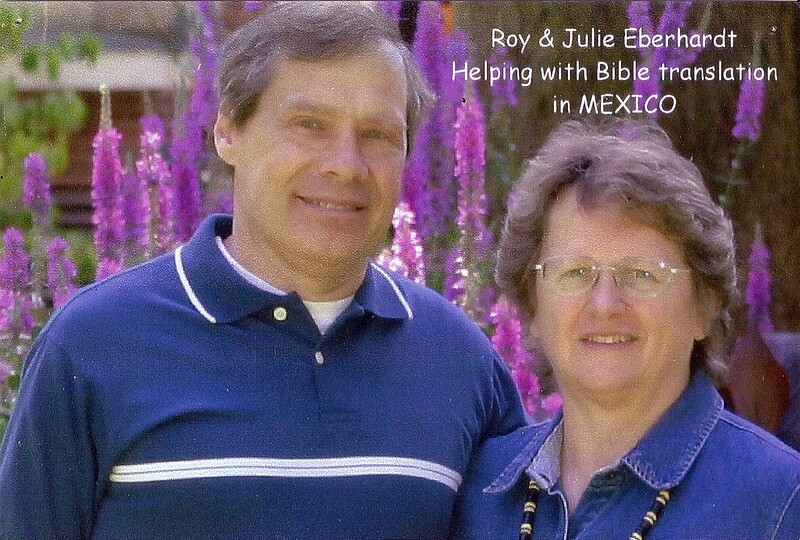 Roy and Julie Eberhardt are living in Mexico and ministering to the people of Oaxaca, Mexico so they can learn more about the mercy and grace of our Lord Jesus Christ and the new life He offers to anyone who accepts Him as Lord and Savior. They also provide technical support to other missionaries translating God's Word into other languages. The ministry of Cherith International is seeking to fulfill the plans and purposes of God in accordance to His will. The purposes of Cherith International are to care for orphans, to help those in need, and to encourage pastors and Christian workers who are serving congregations in remote areas. In addition, Cherith International provides opportunities for people to serve overseas through short-term Helping Hands mission trips.